BlackBerry has just announced in a media event that company is finally bringing its Blackberry Messenger service to third-party devices with launch of BBM on iPhone and Android platform. You may found out it a bit late try from BlackBerry to come on iPhone & Android to conquer its main business platform. 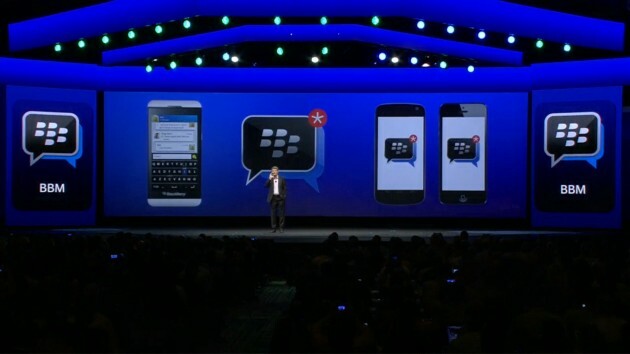 BlackBerry surprisingly made announcement of launching its BBM services to iPhone & Android platform. The BlackBerry Messenger services is not going to be exclusive enough for both major smartphone platform users. It is merit mentioning here that both platform Android & iOS has already major cross-messaging services application available for their users, applications such as WhatsApp & Viber has recently announced that they have crossed more than 200 active million users on their services which hints at the success of cross-platform messaging services than BlackBerry Messenger services. BBM launch on cross platform devices is now officially confirmed, we know that there were lot of rumors in the late 2010 and as well as in 2011, which claimed that BlackBerry is bringing the BBM to iPhone & Google’s Android platform. BlackBerry Messenger will release this summer for iPhone & Android phones, and it will be available as free service in both Google Play Store & Apple’s App Store. Furthermore, the application comes with a little high requirements from the users. It will require users to be on iOS 6 for iPhone, and on Android 4.0 for Android phone. According to BlackBerry, the BBM service claims to be handling more than 60 million active users on their servers around the world. In addition to the their bragging claim, the company has announced that in late 2013 update to BBM Messenger on iPhone & Android will bring the voice & video chatting feature. BlackBerry Messenger has positive reputation across the world for their business class services, and the service that allows you to connect with major businesses, brand ambassadors and celebrities across the nation.